We are a non-profit organization staffed by volunteers! ​Turtle nesting season runs from May 1 until October 31. During that time we patrol the beaches daily to look for turtle crawls. Turtle crawls are unique patterns left in the sand by turtles when they come out of the ocean and onto the beach (see image to the right). When we find a fresh crawl, we determine whether a nest has been laid or if it is a false crawl (non-nesting emergence). If a nest was laid, we use four stakes with colored survey ribbon to cordon off the area. A unique identification number, the date the crawl was found, and the initials of the volunteers who found the nest are written on one of the stakes. A Florida Fish and Wildlife Conservation Commission (FFWCC) sign which states that it is illegal to disturb the nest is attached to another. We also complete a nesting report and plot the crawl on an aerial photo. After the nest hatches, we do a nest evaluation to determine and record its success. We split our section of Volusia County into two parts: North and South, so we can complete our morning surveys before beach driving begins. The south run is done by driving a 4-wheel drive vehicle from Sun Splash Park to the Ponce Inlet Jetty. The north run is done by 4-wheel drive vehicle to the Old Ormond Pier (tide permitting). The last four miles are done on an ATV. Flagler County is split into three sections: Flagler North, Flagler Beach, and Flagler South. All 3 of these runs are done on ATVs due to the nature of the coastline and rocky shore. Summer Haven beach in St. Johns County is patrolled on foot and by ATV. 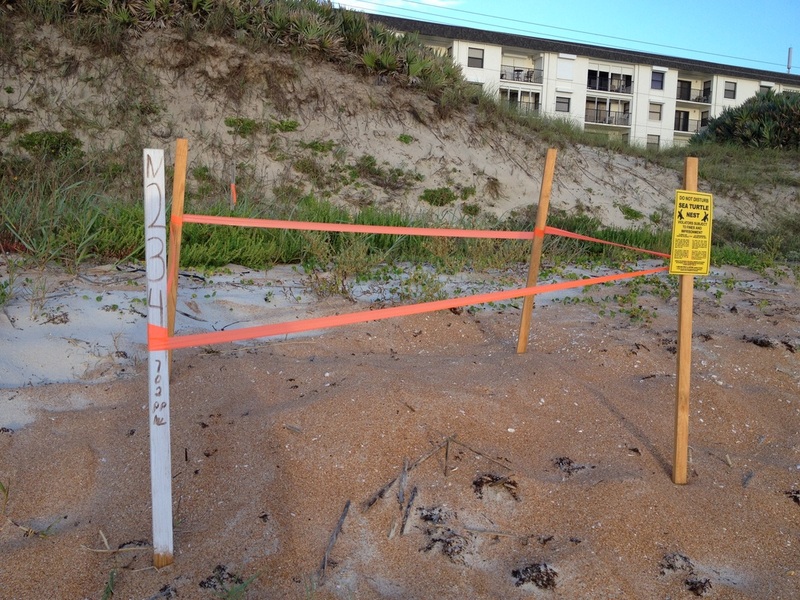 Turtle Nest marked with Orange Survey Ribbon. Different survey ribbon colors mean something. The color of the ribbon around the nest denotes the month in which the nest was laid. Nests laid in May have pink ribbon, June has blue, July has orange, August has green, and September returns to pink again.